We all love Britpop — changed the world of music back in the day. Now it’s time to change the world of maps. Britmap. 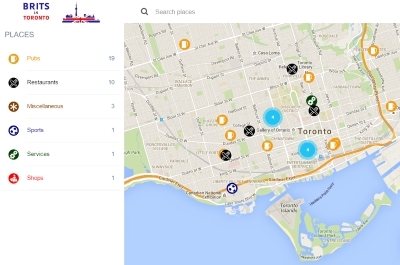 A map of Brit-related places and other useful services in the GTA. We encourage you to add your establishment (we approve them all) or subscribe to the feed and alerts. Let’s put Brits back on the map! This entry was posted in Uncategorized and tagged britmap, brits in toronto on September 10, 2015 by britsintoronto.